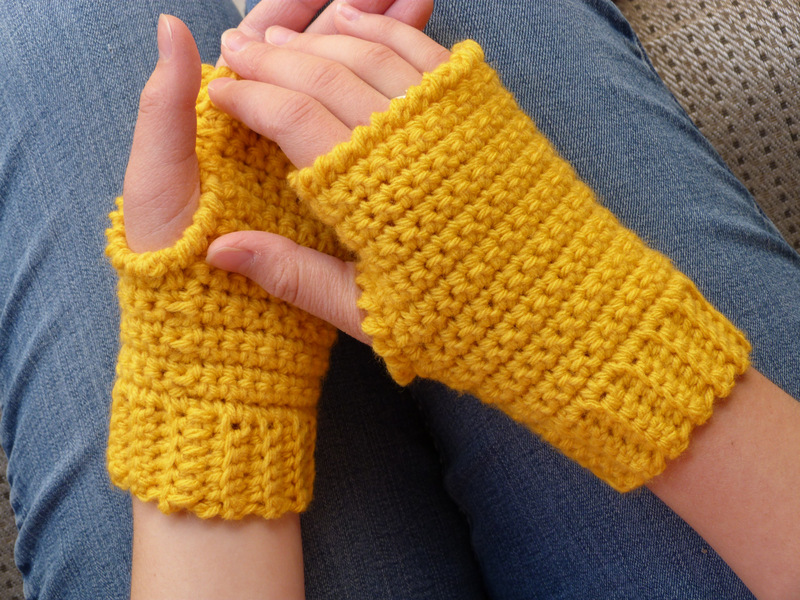 When I first got into crocheting many years ago, fingerless gloves were my favorite to crochet. I made many versions for different people, as well as for myself, and played around with length and style. I remembered a pair that I made that were short and simple and decided to design another “short and simple” pair with a few techniques to make them look more advanced, like adding a cuff and reverse crochet trim. These gloves really are surprisingly simple to crochet. And they don’t take a lot of yarn either! Make yourself some over a weekend or make up a handful to give as gifts this Christmas. 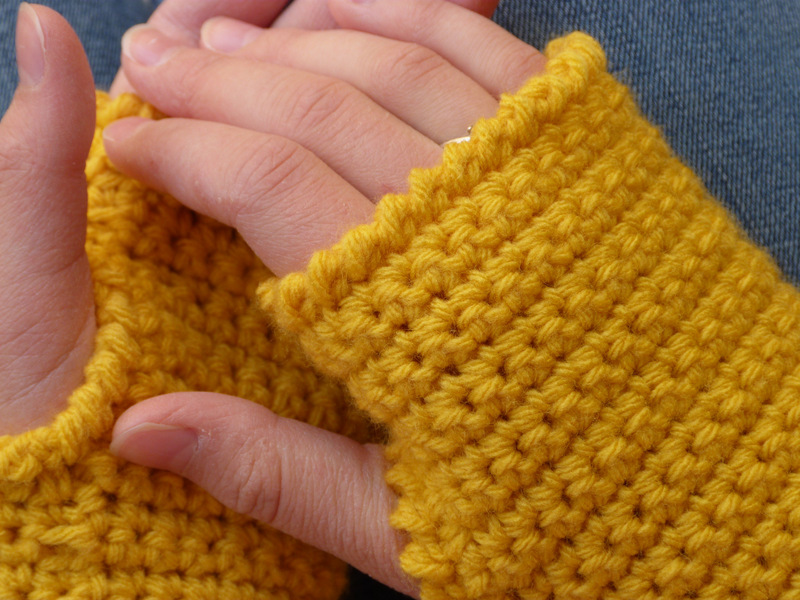 To adjust the size of the glove, crochet more or fewer rows in the cuff. When coming to the thumbhole in Round 8, if you have added more rows to the cuff for a larger size, continue by subtracting 3, or even 4 if you’d like an easier fit, from the initial stitch count. If you have subtracted more rows to the cuff for a smaller size, continue by subtracting 3 or only 2 for a snugger fit, from the initial stitch count. Tip: try the glove on while you crochet so that you can adjust it if you need to as you go and ensure you get the best fit. Do not finish off. Sc ends together and flip band inside out. Join yarn in any st on thumbhole and sc around. Then reverse sc around to finish. If you have any questions or difficulty crocheting this pattern, let me know in the comments below and I’ll be glad to help! This entry was posted on Tuesday, November 20th, 2018 at 1:19 PM by Amy	and is filed under Free Crochet Patterns. You can follow any responses to this entry through the RSS 2.0 feed. You can skip to the end and leave a response. Pinging is currently not allowed. I love that the pattern is simple but the gloves are gorgeous! Yay, that was my purpose! Thanks Erica! Have made many Crochet Spot Patterns including this one. Why is the instruction under the “Gauge swatch” title have different instructions for row 1 and 2 than in the actual pattern instructions? Maybe I don’t know what “Gauge Swatch means? A gauge swatch is a simple pattern you can work up quickly to compare your swatch with the swatch the designer made to allow you to see how near your tension is to the designers. Some designers just tell you the gauge and let you work it out as you crochet but others will offer a simple swatch pattern you can work up to help you determine first the materials you will need before beginning the pattern. Hi, I’m just about to start this but my wool doesn’t appear to have any weight measurements on it, so I’ve been making gauge swatches, but I’ve realised that there’s no hook for it, is it the 4 mm or 5mm that should be used for the gauge? I always tend to crochet a bit tight so want to make sure I’m going right from the start if I can! Hello Rose, sorry for the mistake. The gauge is worked with the H/5.00mm hook. I have updated it in the post. Thanks for letting me know! Thanks for the reply! It worked out best for me with 5.5 and 4.5 gauge hooks in the end, I’ve made one glove now, just need to get on with the next one!